【１回目】17:00　開演　【２回目】19:15　開演(入替)　sold out ! 【１回目】　13：30　開演　【２回目】　18：30　開演　(入替)sold out ! 『Kata&Mimi　スペシャルライブ！』　sold out ! 「スペシャル企画　藍澤幸頼の聞きたい方々vol.4」　sold out ! 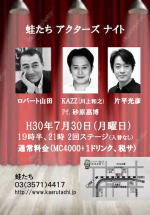 ・・・安奈淳　三矢直生・・・ sold out ! 【１回目】　14：00～sold out ! 【２回目】　16：30～sold out ! 競演 pf 城所潔　sold out ! 「宝塚Day　南海まり LIVE」　sold out ! 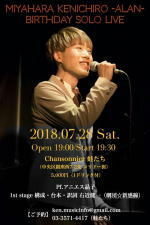 「【宝塚デイ CWAJ】三城礼 ﾁｬﾘﾃｨﾗｲﾌﾞ」　sold out !